In Volume 1: In the Beginning [Genesis], introduce your children’s ministry to Buck Denver and his friends as they kick off their journey through the whole Bible! Volume 1 introduces the Bible – what it is, who wrote it, and why it matters – and tells the stories of Adam and Eve, Noah and primeval history! Week 1: The children will discover what’s in the Bible by learning who wrote the Bible and how the Bible is organized. Week 2: The children will learn who wrote the Bible, how God inspired the authors of the Bible, and all about the books of the Bible. 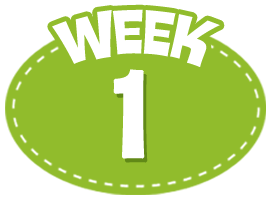 Week 3: The children will learn about Genesis – the first book of the Bible! Week 4: The children will learn about Primeval history, and learn about sin, free will and choices. Video 1 Welcome Buck Denver delivers breaking news in this fun welcome video. Small Group 1 Relationship Building Everyone has a chance to deliver their own breaking news to their small group! Video 2 Learn: Do You Know About the Bible? Video that teaches that the Bible is one book made up of many different books. Small Group 2 Smarter than Clive and Ian Small group trivia game that reviews the topics covered in the video. Video 3 Learn: What's in the Bible? Custom Video teaches about different parts of the Bible - the Pentateuch, Septuagint, Old Testament and New Testament. Small Group 3 Buck Denver's Dizzy Doodle Creative drawing/art game helps reinforce the lesson about the different parts of the Bible. Video 4 Bible What's It? Lively trivia game that reviews the day's lessons. Small Group 4 Bible What's It? and Recap Review Time - this is a time to review the day's lessons, and reflect and pray before ending class. Video 1 Welcome Custom Welcome Video: Buck Denver delivers weather news in a fun welcome! Small Group 1 Relationship Building Each child has the chance to deliver his/her own weather news to his/her small group. Video 2 Review: What is the Bible? Review video that recaps last week's lessons about the Bible. Small Group 2 Smarter than Schniffenhousen Fun activity that encourages kids to use their Bibles to find answers to questions. Video 3 Learn: Who Wrote the Books of the Bible? This video teaches about the human authors of the Bible, as well as the Divine Author (God). Small Group 3 Wrote It Round Up Fun bingo-type game that has children answer questions to receive pieces, which they place on a game board. It reviews the content of the video. Video 4 Bible What's It? Fun, fast-paced trivia game that reviews the day's lessons. Video 1 Welcome Custom Welcome Video: Buck Denver delivers sports news in this fun video. Small Group 1 Relationship Building Each child has the chance to deliver his/her own sports news to his/her small group. Video 2 Learn: Genesis Song In this video, the Fabulous Bentley Brothers sing a very catchy song about Genesis. Small Group 2 Genesis Top Ten Art/drawing game encourages kids to draw the stories they've learned from Genesis. Video 3 Learn: Genesis & Primeval History Video that shares the rest of the stories from Genesis, including Noah and the Tower of Babel. Small Group 3 Jazinga! Fun game that involves answering trivia questions and tossing game chips into a trash can - don't forget to yell Jazinga! Video 4 Bible What's It? Review Time! Trivia game that reviews the day's lessons. Video 1 Welcome Custom Welcome Video: Buck Denver delivers travel news in this fun video. Small Group 1 Relationship Building Each child has the chance to deliver his/her own travel news to his/her small group. Video 2 Review: Genesis This video reviews the Bentley Brothers song about Genesis. Small Group 2 Bentley Brothers Cards In this game, kids earn cards and then use them to sing along to the Genesis song. Video 3 Learn: Genesis & Sin Video that introduces the concept of sin and God's rescue plan to save us from it. Small Group 3 Jelly Spell Spelling game that allows kids to spell the answers to trivia questions with paper cups that have letters on them. Video 4 Bible What's It? Review Time: Trivia game that reviews the day's lessons.